In his first visit to India, Nepal’s prime minister focused on the economy rather than thorny political issues. Nepal’s Prime Minister K.P. Oli just paid a three-day state visit to India, his first foreign visit after taking office on February 15 this year, and his second visit to India as prime minister. During the visit, from April 6 to 8, Nepal and India signed just three new agreements — a partnership in agriculture, as well as plans for connectivity through inland waterways and expanding linkages to connect Indian railway lines to Kathmandu — breaking the tradition of signing a long list of documents. Both sides described the three initial agreements as “path breaking agreements” to boost connectivity between the two countries. The two prime ministers also inaugurated a petroleum pipeline to be constructed between India and Nepal. Oli’s trip to Nepal’s southern neighbor was keenly watched in both the national and regional arena for a couple of reasons: his anti-India rhetoric during the campaign season, his determination to expand cooperation with China to decrease dependency on India, and the strong expectation that he would try to resolve several pending contentious issues with India. The much-publicized and much-awaited visit to India, however, produced less in substances and more in rhetoric. Both sides have kept contentious issues at bay, stating that they want to build up a forward-looking approach in bilateral relations. In fact, for their domestic political constituencies, both prime ministers had to display that bilateral relations are back on track, underplay their differences. Thus, their points of emphasis were more on the cosmetic side instead of focusing on genuine bilateral issues. It would be relevant to judge the outcomes of this visit in the context of Oli’s previous visit to India as a prime minister in 2016, immediately after a four month blockade along the Nepali border. Oli had returned from India in 2016 saying that “misunderstandings between two countries have been cleared,” but differences were clear. In fact, due to disagreements — mainly about whether or not to mention amendments to Nepal’s newly passed constitution and the 1950 Treaty of Peace and Friendship Treaty — no joint press statement was issued at the conclusion of Oli’s 2016 visit. This time, a 12-point joint statement was issued, avoiding key contentious issues between two countries. In a positive sign, the question of constitutional amendment, an internal issue of Nepal, was not mentioned in the joint press statement this time, though it had previously been included on past visits. This issue was figured out in the bilateral talks between Oli and Indian Prime Minister Narendra Modi. Before the visit, there were expectations that Oli, with a two-third’s majority and popular mandate at home, would take up the issue of revising the Peace and Friendship Treaty. During the campaign, Oli often talked about the revising the 1950 treaty, saying that it is unequal for Nepal. The beginning point of the Oli government’s agenda of “resetting and redesigning” relations with India is revising or scrapping the treaty, which has served as the bedrock of bilateral relation since 1950. The joint press statement issued after Oli’s visit does not say anything about the revision of the treaty, however; this too had been mentioned on the previous visits. The Nepal-India Eminent Persons’ Group (EPG) is revisiting all bilateral agreements to submit a comprehensive report to both governments on how to reset bilateral relations. However, without substantial negotiations at the government level, progress on revising the treaty is highly unlikely. Border disputes between two countries are another contentious issue that occasionally creates friction in bilateral relations. To enhance people-to-people relations, Nepal and India must resolve contentious issues relating to the border, including the two major areas of dispute at Susta and Kalpani. Four years ago, the two countries agreed to start talks at the foreign secretary-level in order to resolve the problems at Susta and Kalapani; however, not a single talk in this regard has taken place yet. Before embarking on his visit to India, there was pressure on Oli to raise those issues with Indian political leadership but the issue was not mentioned in the bilateral documents. Aside from the disputes in Susta and Kalapani, there is a need for construction, restoration, and repair of boundary pillars, and the clearance of no man’s land on both sides. Besides the technical aspects, the disputes at Susta and Kalapani must be resolved through dialogue by the political leadership. However, the leaders of both sides seem unwilling to take up this contentious issue. Another point of friction relates to India demonetization. In November, 2016, Modi announced his government would demonetize the Indian notes of 500 and 1000 rupees. This badly affected Nepali nationals residing in Nepal as well as in India because those notes were legal tender in Nepal. Nepali leaders and officials time and again requested that the Indian government make arrangements for the exchange of those notes held by Nepali nationals. Indian ministers and high-level government officials continued to assure that old notes held by Nepali citizens would be able to be exchanged. Before the visit, Oli had pledged to discuss this issue with India, but it did not figure in the official documents. Asked about the demonetization question, Indian Foreign Secretary Vijaya Gokhale, while addressing journalists in New Delhi on April 8, said that “This issue was not raised at any of the meetings.” Similarly, other several issues related to trade and transit were not mentioned in the joint press statement. The visit, however, generated some positive vibes to reset and redefine bilateral relations. First, the visit triggered a new discourse in New Delhi: India must respect Nepal’s sovereignty; mutual respect is a key in bilateral relations; and India should not meddle in the internal political affairs of Nepal or panic over China’s growing investment in Nepal. 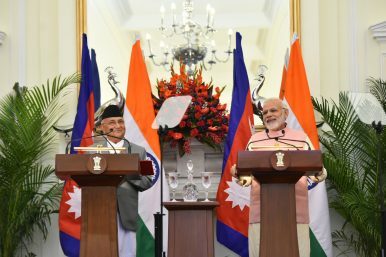 There are pressures on the Modi-led government in India to enhance ties with Nepal on the basis of these principles and work with the Oli-led government, which commands a two-thirds majority in Nepal’s House of Representatives. Second, it seems that Oli has given a clear message to the Indian side that he wants to focus on economic diplomacy, to secure India’s support in his efforts to advance economic development and prosperity. In this context, both countries are preparing to focus on economic and development issues instead of political and other thorny bilateral issues. While addressing a business gathering on April 6 in New Delhi, Oli wondered why Indian investors are not investing in Nepal. “Indian investors have invested across the globe so why not to go to the next door Nepal? Geographical proximity, easy access, cultural similarities are all there to make you feel good about Nepal. Seize the opportunity,” Oli told the business community. Oli further stated that that development and prosperity are universal goals and all nations have legitimate interest in achieving them. “We must therefore recognize the development space for everyone. Development must not be seen through the optics of geopolitics,” Oli said. As India and China are competing to increase their influence in Nepal, Oli is trying to balance policy with both neighbors through a special emphasis on economic development. Talking about neighborhood policy, Oli had said that mutual trust will be the key ingredient of Nepal’s relationships with India and China. “In particular, we will remain engaged in the ‘vibrant economic drive’ of the neighborhood with a view to benefitting from it. We respect the legitimate interests of our neighbors and will not allow anything against them in our soil,” Oli said. With wrap up of his India’s visit, Oli’s next destination will be northern neighbor China, where he is expected to sign a few deals on projects related to China’s Belt and Road Initiatives (BRI). During his earlier tenure in 2016, Oli signed groundbreaking agreements with China, including on trade and transit, and there are hopes that Oli’s visit to China will expedite those plans. Oli plans to bring massive investment from both India and China to fulfill his domestic promises of economic development and prosperity. Kamal Dev Bhattarai is a Kathmandu-based journalist who writes on foreign policy issues.